The Jackson Hole Conference was a dud. To the astute student observer, something happened never seen before. The US central bank chief admitted failure, if only people could properly interpret and translate his words of helplessness and disappointment. A more apt description was that USFed Chairman Bernanke used the forum to announce on stage that the central bank failed and is powerless to react to the current lapse into recession. Many watchers no longer believe that a Quantitative Easing chapter #3 will be announced. Surely it will come sooner or later. Watch the USTreasury auctions for the best clue. The QE2 program was about prevention of auction failure, not economic stimulus. A quick review of monetary policy and its effect is horrifying for its utter complete failure. The FedFunds rate has been under 0.5% for three years, yet neither the USEconomy nor the US housing market have recovered. That is a first in history. The USFed gobbled up over $1 trillion in toxic mortgage bonds and related derivatives, also with no resulting rebound in the housing or mortgage finance markets. The QE2 debt monetization program averted USTreasury auction failures, but the bold monetary inflation gesture sustained for several months did cause a backfire. It lifted the entire cost structure to the USEconomy in painful fashion. The profit margin squeeze and household spending squeeze have been radically evident and deeply damaging. Chairman Bernanke admitted on stage before his peers, in full admiration of his failure and lost leadership, that the USFed has no more tools at its disposal, and that the USEconomy must recover on its own. For the first time he mentioned tools at his disposal without delineation what they were. He has none. His heavy doses of liquidity to treat insolvency have not succeeded in achieving anything except higher costs without job growth. He even attempted to point the finger of responsibility to the USGovt for its budget extravagance and intractable deficit. Big Ben has crashed his helicopter without any cash drops on citizen homes. Worse, he has shown all on stage that he has nothing under the hood, and that the bulge below is nothing but a massive paperwad in his pocket. The USFed is impotent. Its board members are in open dispute on the chosen path for QE3, even the scored success of QE2. The US Federal Reserve is a failure, its franchise system a failure, its monetary policy a failure, its balance sheet a failure, its analysis chronically incorrect, its initiatives in backfire, its toolbag empty. Perhaps it is time for the USFed to resign its contract with the USCongress. The crowning blow should have been the $16 trillion in unauthorized loans to global banks, given cloud cover by the TARP Fund and its confusion. This is a syndicate fortress with its own agenda, nothing more. In past analysis, a Jackass viewpoint has been shared concerning the Competing Currency War. A sense of stability can be achieved, if only the European mess can be equated with the American mess on equal footing. For the past two years, the bounces and jumps in the USDollar have often come by wretched comparisons to the Euro currency. The Euro is uglier, therefore the USDollar looks better. But Europe has a huge distinction. Their many broken sovereign bonds from member nations trade at different bond yields, thus differentiating them. The Euro currency thus trades on interest rate expectations, rather than what Wall Street compromised analysts believe. EuroCB head Trichet is the object of language dissection also. His latest utterance indicated no longer a concern over inflation, thus prompting forecasts of no more ECB rate hikes. The European banks have a colossal problem as an extension of the rate differential Trichet brought about with the official rate hikes this year. The European inter-bank lending is in the process of seizure, as in the money market funds. Call it an unintended consequence from the EuroCB attempting to make distance from the reckless USFed monetary policy. Just another casualty in the Competing Currency War. The Euro Central Bank did not want to follow the USFed into the monetary hell-hole in 2009. The USFed went down to 0%, but the EuroCB chose not to follow. The Euro currency rose too high as a result, up to the 150 level, harming the German import trade. Just another casualty in the Competing Currency War. In fact, the war kills all economies and destroys capital uniformly. The corps of sell side analysts seem never to factor in the bond yield effect, choosing to paint Europe with a single broad brush incorrectly. My theory is that the USFed is waiting for Europe to announce and come to a more firm agreement on bailouts of the expanding sovereign debt crisis. The EUR 850 billion pledge to the European Financial Stability Fund hit the rocks quickly, as German bankers pulled their support. The Europeans must contend with contagion, as the sovereign bond toxicity has moved across the borders into Italy and France. Funny how Spain has avoided the axe, but France has been thrust onto the firing line. The USFed is waiting for the Euro Central Bank to take action. The key is the EuroCB debasing its Euro currency in the next move, which will give the USFed permission to debase its USDollar currency in its next move. They require coordination. Japan and Switzerland are doing their part in monetary debasement, having learned much from the Americans. The inescapable truth is that in the larger context it does not matter since both the Euro and USDollar are doomed. When Greece or Italy or Spain defaults on sovereign debt, or France is bailed out on sovereign debt, all of which are inevitable, the landscape will see 20 Lehman-type bank failures, perhaps some in London and New York. The strategy is clear. The central banker rats are cornered. The USFed is tangled in a US$ straitjacket. It cannot continue on its QE2 or advance into QE3 without a dance partner in Europe capable of stepping in the quicksand at a matching pace. If Bernanke Fed goes it alone, then the puss from the USDollar will break through the FOREX skin surface. That would cause a rash of rising costs in the entire commodity sector, from gasoline to food to cotton to metals to paper to scrap. The myopic wrong-footed analytically incompetent Bernanke, still widely revered for his leadership to ruin in a sequence of direct iceberg hits, would prefer that European monetary authorities dispense trillions more Euros to save their wrecked banks. The tragedy lies in the fact that neither the large American nor European nor London banks can be saved. Ample or accelerated liquidity does not fix their insolvency. The key is the falling housing markets, still on a downward course. The key is lost industrial bases, handed to China as part of the grand plan. That plan pertains to designed ruin, gold leases, and consolidated power. The USFed, like the USDollar, is cornered. The historically unprecedented nearly $2 trillion in debt monetization fixed nothing. Take a look backwards at the lack of options that the USFed faced. In 2007, debate was over whether the USFed should drop the interest rate. The mortgage crisis was erupting from its subprime core. The USFed openly admitted its reluctance to lower rates, since doing so would invite inflation to the dinner table. After crisis struck the banks, after the stock market dived, after the recession was obvious, the USFed took action with sharp sudden big rate cuts. They were suddenly heroes whose elbows rested over the liquor cabinet. They are as lousy at policy delivery as with economic analysis topped by forecasts. In early 2010, the USFed was again cornered without options. It was pressured to keep the near 0% steady, since the housing market was so fragile. They openly spoke about an Exit Strategy from the ZIRP jail. The Zero Interest Rate Policy, for adept students, is a permanent prison, something American economists refuse to comprehend or believe, due to blindness, incompetence, intellectual compromise, and syndicate devotion. So instead of exiting from the 0% corner, then doubled down with a Quantitative Easing enema, both forecasted by the Jackass. Being in a straitjacket is compounded by massive bloat of liquid infusions. The excrement is played out on the USEconomy directly, but the global economy as well, from the rising cost structure. Questions abound while for almost five years, the USFed has been out of options. Should they pop the housing bubble they so eagerly created in 2006 by hiking interest rates? Should they instead encourage price inflation by lowering rates below the prevailing inflation rate, as in free money? Should they prevent a galloping recession, or encourage more asset bubbles? Should they lap up the excess liquidity, or rely upon inflation as a growth engine? Should they take away bank loan loss reserves, or leave the Fed balance sheet exposed as wrecked? Should they go it alone with QE3, or enlist the aid of other central bankers in a Global QE? Should the primary bond dealers be hung out to dry as they swallow huge USTBond supply, or continue the 3-week roundtrip to FOMC coverage to hide the complete auction farce of indirect backdoor bond monetization? Should the stock market be used as a justification for massive QE3 liquidity infusions in a departure from the Fed charter, or permit the stock indexes to settle at lower levels in synch with the reality of recession and profit squeeze? Should they attempt to let the banking system run without crutch props and intravenous lines, or continue them in a manner that displays the USFed acting as the entire banking system intermediary octopus? Should they let the USEconomy falter badly in order to encourage USTreasury Bond demand in a stock fund migration, or stand aside and not crowd out the bond market which is vital to capital formation? Should they permit a large already dead US bank to fail, in order to gain more emergency powers and earn the side benefit of a black hole to lose more data? Should they simply continue doing what they wish, and simply lie much more? It is extremely safe to conclude that the USFed has no good choices. It is without alternatives or tools. The deception is topped off by decisions to deploy the powerful leveraged Interest Rate Swaps. They enabled the 10-year USTNote yield to fall to 2.0% and paint a billboard to contradict the risk of USGovt credit worthiness. Soon the Office of the Comptroller to the Currency will not report such derivative data, since it is so clearly the tool to keep long-term interest rates down. The IRSwap not only pushes down rates, but creates artificial end demand for bonds that covers the $trillion bond fraud committed by Wall Street firms. They lost their investment banking business, but found a ripe channel with USGovt cloud cover. All hail the resilient USTreasury Bond asset bubble. It is a sponsored Black Hole. It will starve the USEconomy for capital. Its supply will grow from even larger deficits. Its appetite will grow. Its funding needs will grow. It will demand QE To Infinity. The USTBond bubble will destroy the USDollar. It will destroy the entire fiat monetary system. The pathogenesis will require the passage of time before conclusion, more than the Sound Money advocates believe, but not as much time as the Powerz believe. The pace of internal systemic devastation has turned rapid. The language to cover their actions is full of deception and veiled intrigue. The USFed never discusses the risk to USTreasury auctions, the real reason they instituted QE1 and QE2, and the actual reason they will be forced to institute QE3. They further cloud the stage with their nonsense about deflation. The pendulum moves from inflation to deflation over the many years and back whenever the USFed must justify its destructive policy. The ringtones of deflation were frequently heard a year ago when QE2 was announced. They actually said that with higher risk of falling prices, the need for QE2 was urgently pressing. The latest ringtones direct attention to an economy denied as showing signs of recession. Bear in mind that the Bernanke Fed has not correctly assessed breakdown risks, has not correctly analyzed any risk of bond contagion, has not correctly anticipated any price shocks, and has dutifully channeled $trillions to big banks in the open and in large quantities shrouded by secrecy. Last week the Jackass was on high alert for the trigger for a US Stock market rebound. Anything reasonable would serve the purpose. It arrived with vivid deception and full banner. The durable goods report was the road car decided upon to wave the green flag on the track. The headline number was sufficient to paint on the pace setter car. It stated a 4.0% rise in durable goods orders for July. Yippie!! But please do not bother to read the details, since the audience was both mathematically challenged and in desperate need of good news. The quick hint was given when the huge Boeing order was a key item on the supposedly positive news. The durable goods order figure excluding transportation was up only 0.7%, not good, not bad. Those big one-time aircraft orders do skew the data indeed. Another item skews the data, basic weapon system orders required to sustain the endless sacred wars. They are devoted to destruction and fraud, not nation building, at home or abroad. Since the Hat Trick Letter began, the focus has been given to the real CAPEX order statistic. It is defined as the ex-defense, ex-transportation capital goods orders. For July this figure came in at MINUS 1.5%, heavily watched by competent economists. The revision for June was plus 0.6% growth. The competent economists were either drowned out, or decided to swallow their integrity. Their voices were not heard, or their mouths were covered. Often they do speak about the more meaningful CAPEX orders. Much more additional extra weight of recession and its pressure comes from the federal and state budget slashing and immediate job cuts. This is basic science that escapes the compromised majority. Alcoholics Anonymous has a wonderful principle put to practice, which cuts through the maze, the nonsense, and the denials. If a USEconomic recession was not painfully obvious even to the street bums and bank parasites, then why is the question asked 38 times per day?? At the household level, if the chronic question of Uncle Albert being a drunk keeps being asked and repeated in discussion, even at the dinner table, then the question itself is a confirmation of his alcoholic condition. The other rationalization tools often relied upon by the denial experts have been brought forth in the financial press. The bad weather from the spring rains in the Plains and Midwest were a drag. The Japanese supply chain disruption from their earthquake and tsunami disasters, followed by the Fukushima nuclear meltdown, they too were a certain drag. Then came the freeze in business decisions and commitments from the stalemate on the USGovt budget impasse. It also contributed to the drag. Lately, the crutch is Hurricane Irene which slammed the entire eastern seaboard, causing floods and power outages. The storm and its damage are an unmistakable drag. To be sure, monetary policy, fiscal policy, stimulus policy, and economic policy are all fine and dandy. The problem is all the one-off exogenous factors. What a crock!! A truly perverse dynamic is at work. The expectation of economic recession is widely seen as a byproduct extension of the major US Stock indexes. This is backwards, since the painted tapes and high frequency trading and foreign subsidiary profits and doctored economic statistics are the norm. The S&P500 stock index has become a quintessential leading indicator, and thus the object of manipulative control, a major piece to Management of Perceptual Expectations. The pre-occupation with consumer spending dominates the distorted attention span. In a healthy system, the focus would be on capital spending instead. The nation continues to be stuck in false ideology preached by heretical high priests, a strong remnant from the last decade. The USEconomy was believed in 2001 through 2006 to be dominated by assets as engines, rather than industry and factories. The blockheaded called it the Macro Asset Economy, the latest chapter in their Book of Ruin. Just check the recent data. The USDollar appears vulnerable from two fronts. Since mid-2010, the US$ DX index has been under siege due to the heavy debt monetization of USTreasury and US Mortgage Bonds, during a hyper monetary inflation exercise of grand debasement. The threat from the other side is a US$ DX decline from a return slide into the quicksand of another USEconomic recession. A recession, whether recognized or not, will result in another round of stimulus initiatives of equally questionable effectiveness. More USDollars will be wasted, used, with certain debasement the outcome. 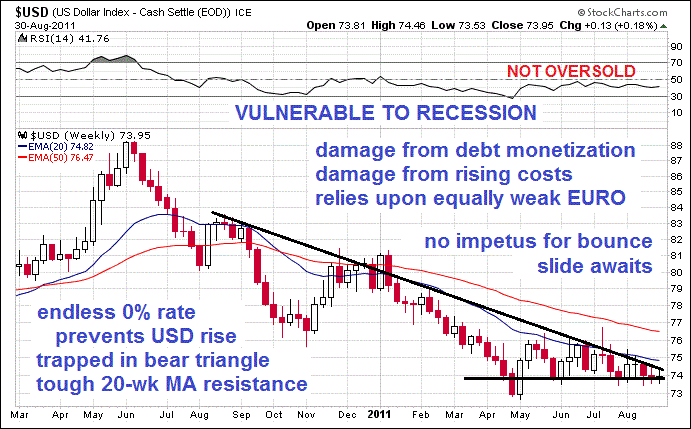 Regardless of the next USFed move, or no move, the USDollar is extremely vulnerable. The only factor keeping it up is the ruin in Europe. Given the double barreled threat of an Inflationary Recession (my forecast), the USDollar is dangerously vulnerable. The biggest upcoming beneficiary to the USDollar and major currency debasement will be Silver. The Gold price made its summer run impressively, reaching 1900. 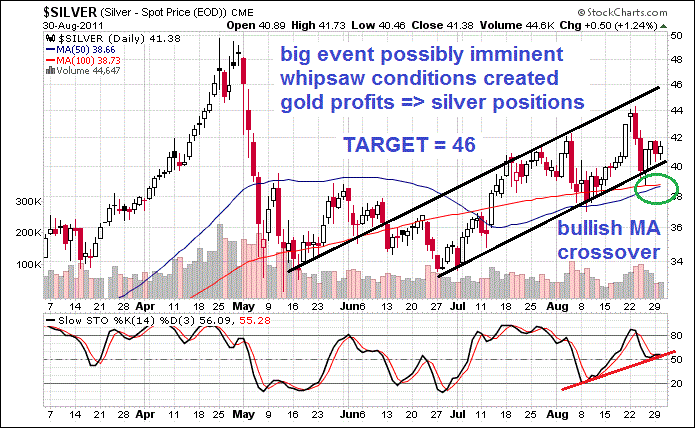 Huge profits are in the process of being switched from gold to silver positions. The 44:1 ratio in price enables sizeable new silver positions to be leveraged. Look out for a significant upward price move in Silver, as its technicals are showing a very positive bullish signal. The simple Moving Aveage is set for a crossover, an event noticed by thousands of commodity and FOREX traders. Silver is unique, being both an industrial metal in shortage deficit, and a monetary metal pursued as a safe haven during a time of crumbling monetary system and rancid sovereign bonds. Always remember that Gold fights and wins the political battles, but Silver rides through the broken phalanx on a white horse to take triple the gains. A hilarious display of vested interest, lifting of fellow broken brethren, and market props of bank stocks came last week. The flagship Deutsche Bank has been a primary player with the London, Wall Street, and Swiss bankers for two decades, working diligently to keep the fiat paper game going, to conceal the gold leasing, and other sundry duties like money laundering with the US agencies. The mighty D-Bank was caught in the toxic US mortgage bond trap, was caught in the housing toxic asset trap, was caught in the naked gold shorting trap, and has been caught in the Southern Europe sovereign bond toxic bond trap. Embattled CEO Josef Ackermann might continue his ruinous tenure until 2013, but that will not remove the criminal charges that lurk over his head. The hilarious display last week came in the form of D-Bank giving a strong recommendation to Barclays and Royal Bank of Scotland, two giant banks in deep throes of insolvency. So a dead bank recommends other dead banks. Perhaps intrepid Barclays analysts can recommend Deutsche Bank, and RBS analysts too. Maybe analysts at Bank of America can recommend Barclays, RBS, and D-Bank all. They surely all participate in flash trading to lift in rapid round robin their exchanged stock shares. Closer to home, Bank of America is a wreck of a diseased hollow tree, a reflective symbol of the irreparably insolvent US bank sector. A quick glance is useful. BOA is very busy selling off its best and only viable assets. It will be left with the hollow tree incapable of withstanding even a mild storm. They took in the Berkshire Hathaway $5 billion in funds from Warren Buffet. Regard this as a second payment toward syndicate membership for Buffet, the first being the Goldman Sachs preferred stock purchase two years ago. Membership has its privileges, avoided scrutiny, and protection from Wall Street ambushes. Then BOA sold its 5% stake in the Chinese Construction Bank, reaping $8.3 billion. The funny part was that BOA executives claimed they did not need the money. Neither does any dying man need food or water. The latest blow was the Federal Deposit Insurance Corp and their rejection of the $8.5 billion cap on the mortgage bond fraud case payoff. This is the bond fraud restitution ring fence, as BOA rounded up its favorite fraud victims, and attempted to strike a deal to limit its liability. The list of plaintiffs in the accord included Blackrock, MetLife, and the New York City. The only problem is that several important mortgage bond fraud victims were not included, like American Intl Group, the USGovt adopted dead orphan. AIG has filed a $10 billion lawsuit against Bank of America. But never fear, the putrid "BAC" stock shares from the grotesquely insolvent bank are rising. Apparently the whiff of Pine Sol and Glade fresheners can produce a short cover stampede, followed by moronic go-go speculator types. The fact of the matter is that 475 thousand jobs have been lost among Wall Street firms, but not enough for executives. European banks have shed 40 thousand jobs in just the last month. BOA has cut all non-essential businesses. Unfortunately, they cut all lines from profitable businesses. They are left with the more pure rot. Liquidation of big US banks deemed too big to fail, since rotten and loaded with toxic paper that inhibits their ability to function as credit engines, while they require unlimited funds to perpetuate their garden of ruin. Liquidation of big housing inventory, since bloated and hanging over the entire market, preventing a price stability situation for another two years (2013), and whose continued bank held inventory expansion assures two more years (2015) on top of that, a result of deep distress if not internal chaos, voluntary loan defaults by homeowners, job insecurity, and property title challenges in court (i.e. permanent market decline). Any bank liquidation would cause the biggest ten US banks to enter a disruptive failure, much worse than Lehman Brothers. The fallout would take years to clean up, complete with a derivative meltdown nuclear chain of events. Any housing liquidation would result in at least a 20% to 30% additional home price decline, sufficient to topple another 500 midsized US banks. So neither liquidation will occur, not even close. All attempted solutions save the broken zombie banks, perpetuate their propped insolvent structure, waste new money, debase the currency further, and require 0% rates to continue. The deep distortions continue to rip apart the nation. None of the current steps taken are sincere legitimate attempts to remedy the system. The countless captains of the ship, mostly wearing Goldman Sachs and JPMorgan uniforms, have no vested interest in remedy. It is as simple as that. Just recently the Standard & Poors head was replaced by a Citigroup vice president. No end to the club tokens used to seat members of the clan. "As the nation screams down the mountain out of control into the abyss, it is good to have a guide. Jim Willie helps to understand what is happening and more important, why. With that information, you can make the right decisions to protect yourself from the current apocalyptic catastrophe. Forget the MSM propaganda. Here is offered good in-depth actionable reports that are the most insightful and valuable." "Your work is by far the most comprehensive, informative, and accurate of all, no question. I cannot overstate how much I have learned from your work. It must be a conscious effort on your part to teach people. Please don't give up on that commitment. Your article on the Petro-Dollar standard is a turning point for any investor or geo-political power observer."